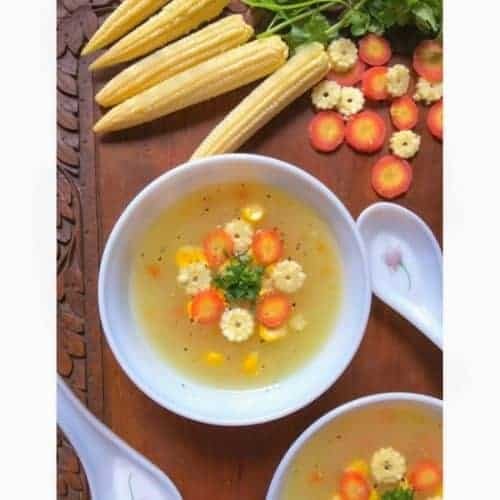 Easy Sweet Corn Soup Recipe: extremely delicious and restaurant style Chinese sweet corn soup recipe that pairs amazingly with any entree. This Easy Sweet Corn Soup Recipe along Yakitori Chicken LING LING Fried Rice is my perfect solution for a delicious and quick meal that’s enjoyed by the whole family. 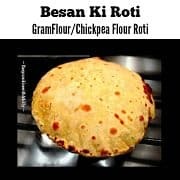 There are days when we are literally so tired that thinking about making a meal after a hectic day seems like the biggest chore and nobody wants to order meal from outside that often. (Although the Fried Rice entree are a meal in itself). I had earlier posted about these “Super Quick Chili Garlic Shrimp Stir Fry with Ling Ling Fried Rice” recipe. 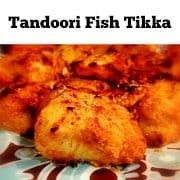 Where I did share how you could quickly make ‘Shrimp n Veggie Stir Fry and serve it along with LING LING THAI STYLE CHICKEN FRIED RICE. This time, we decided to go with the Yakitori Chicken fried rice from LING LING which is a “Traditional Japanese flame-grilled chicken meets rich umami sauce over long grain rice & vegetables”. I literally nibbled half of the microwaved yakitori chicken fried rice as they are just simply amazing !!!! 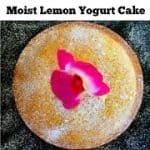 The taste is really fresh and flavorful. 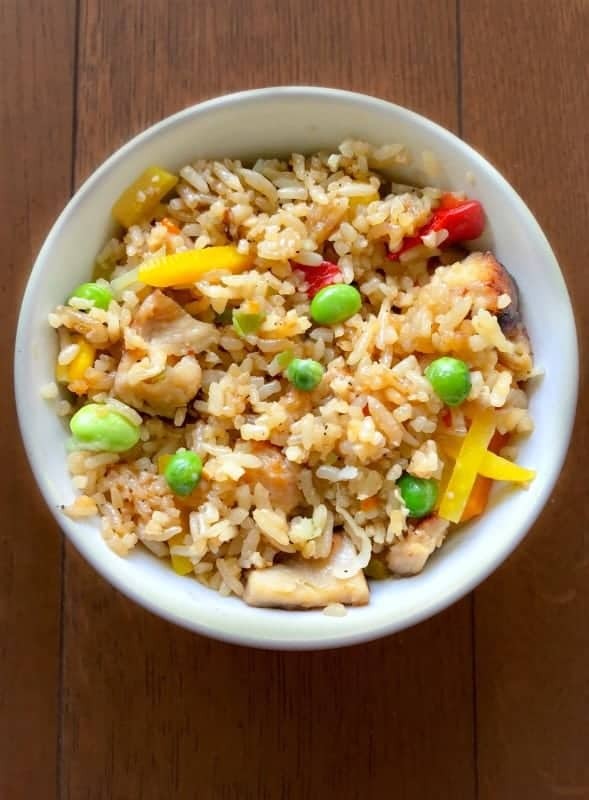 You can literally see and taste the pieces of veggies (peas, edamame, bell peppers) + chicken in each bite and that what makes LING LING FRIED RICE so impressive!. 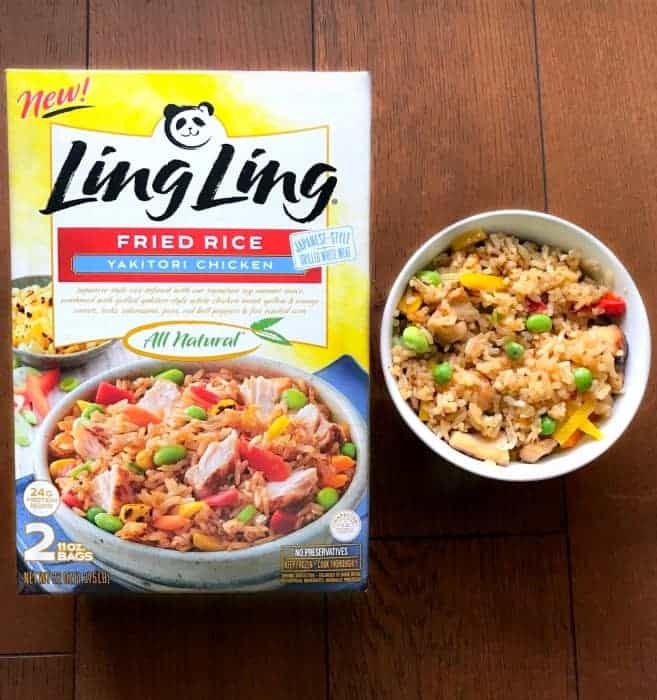 No matter which flavor you try, LING LING delivers superior flavor and exceptional taste because of the Infusion Cooking Method used by them. 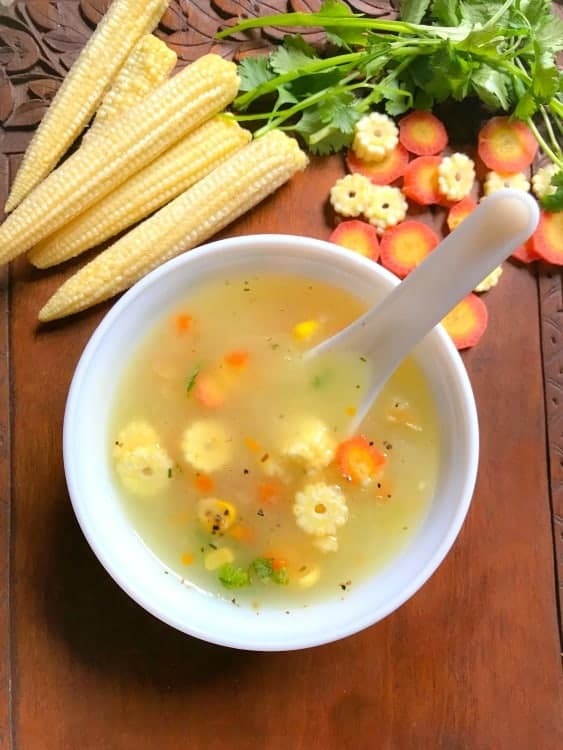 Now, getting back to my Easy Sweet Corn Soup Recipe, it’s actually my all time favorite and also the first soup recipe that I learned to make from Mom. She usually makes it with fresh corn by boiling and churning it into a thick pulp. However, I’m making it using part frozen and part fresh baby corn. You can add stock or water, to get the desired soup texture. We’ll just use the corn paste and simmer it with favorite veggies for 15-20 minutes to get the desirable thick texture. 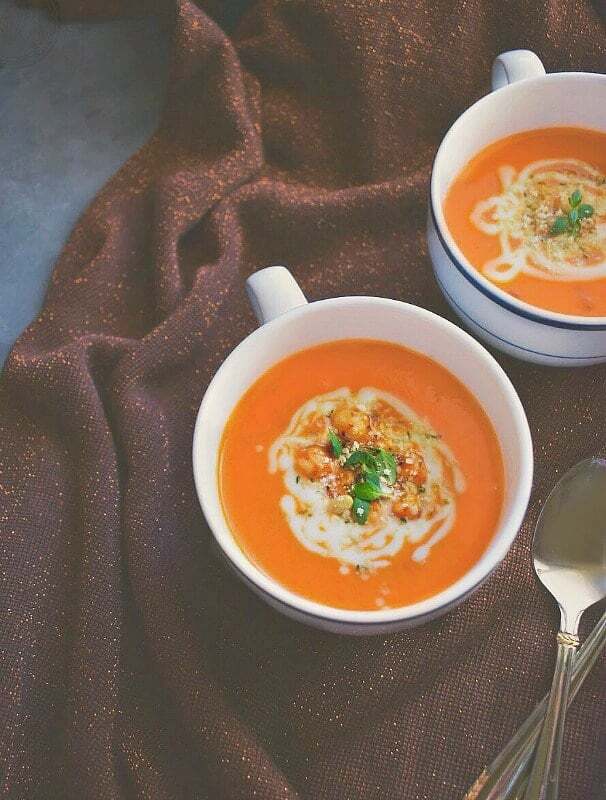 Once the soup is ready, I just some sauteed carrots and corn for that ultimate lush feel. 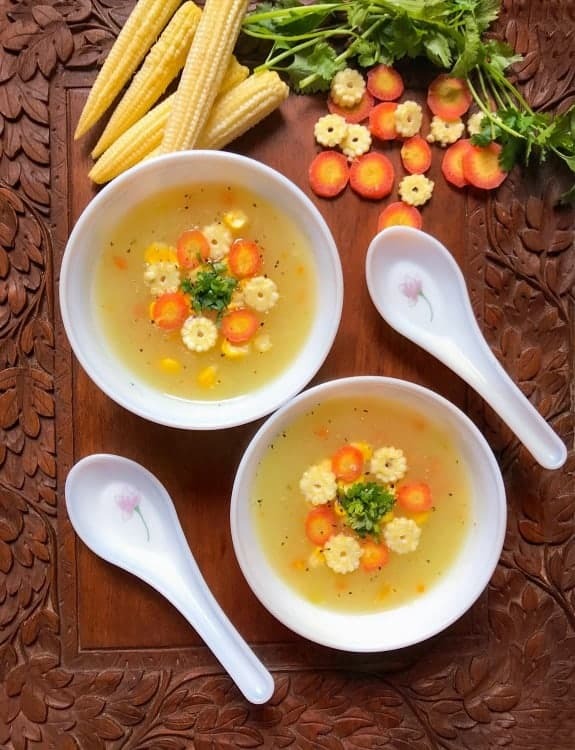 extremely delicious and restaurant style sweet corn soup recipe that pairs amazingly with any entree. In a blender, add thawed sweet con and steamed baby corn. Pulse to form a smooth paste (you may add 2-3 tsp of water to evenly pulse). Heat a deep pan and add 1/2 tbsp oil. Add chopped baby corn, carrots and saute for 1 minute over low flame. 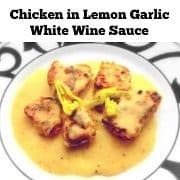 Remove from pan and keep aside for garnish later. In the same pan, now add the pulsed corn, vegetable stock and all the soup veggies. Stir everything and bring to a boil. Reduce the flame and simmer for 5-6 minutes over low flame (stirring every minute). Finally add salt, pepper and corn-starch mix. Simmer for another minute and turn off the flames. Transfer to serving bowls and garnish with sauteed corn+carrot. 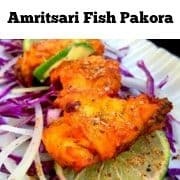 Finally add some chopped cilantro on top and serve immediately. 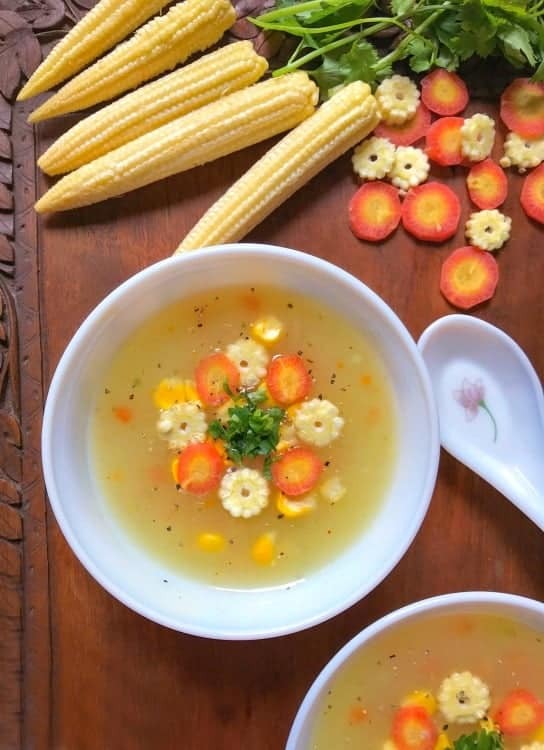 1 Reply to "Easy Sweet Corn Soup Recipe (Chinese Soup)"